The Innermost Limits of Pure Fun, 1969. 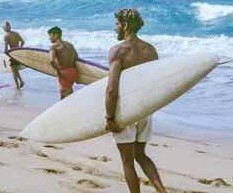 While the progressive reduction of volume and refinement of surfboard design, began in Brookvale in late 1967 and endorsed at the 1968 World Contest in Puerto Rico, continued to advance surfing performance during 1969, in retrospect, most significant contribution was to come from George Greenough. The title of his film, the Innermost Limits of Pure Fun (1970) indicated the future direction of advanced performance, riding inside the tube, as brilliantly conceived and executed in the closing sequence, The Coming of the Dawn. Filmed mostly at Lennox Head and Rincon, this masterpiece was invariably misunderstood by the uninitiated and is easily dismissed by those with no comprehension of history. As of 2014, miniaturisation and digital photography have made comparable footage commonplace. The required surfing skills of these "photographers," however, are simply a pale imitation of those demonstrated by Greenough in 1969. "My two Weber guns were there waiting for me with Randy Rarick and as I lifted them from the nose and looked down the curves, I could see that (Weber's top shaper, Harold) Iggy had done a great job. They had the traditional Hawaiian big-wave board outlines and the hard low rail popular at the time - lying there all ready to go, the boards looked like a pair of racehorses. Both were finished identically with a big Weber sun sticker on the deck, but the best thing about them was that they had fins that had been fibreglassed on; fins I'd sanded myself in California last summer." -Young: Nat's Nat (1998) page 202. Young placed 5th in the final of that season's Duke Kahanamoku Contest and certainly made an impression on the magazine photographers, a Ron Stoner photograph of a slashing cutback at Sunset Beach used for Surfer magazine's (possibly) first fold out cover (Volume 10 Number 3 July 1969). Nat Young, Halewia, Winter 1968. David Treloar: John Otton, Butch Cooney, Peter Cornish, Midget Farrelly, Alan Spargo, Bruce Channon. Bruce Channon: Wayne Lynch, Keith Paull, Richard Harvey, Midget Farrelly, Peter Cornish, Ian Goodacre. Bernard Farrelly: George Downing, Bobby Brown, Keith Paull, John Connors, Joey Cabell, Wayne Lynch. Mark Smith: Colin Hammond, Robert Melling, Gordon Merchant, Keith Paull, Robert Conneely, Judy Trimm. Bob Evans: Midget Farrelly, Phil Edwards, Nat Young, Goerge Downing, Peter Drouyn. Lester Brien Richard Kavanaugh: The two sides of… Leonardo da Kav. A comparison with George Greenough/Ron Realph! No Thanks. It starts Too Manny Arguments. John Russel. Talks about his abilities and influence, the stage 3 fin and spoons 3pages. Tim Murdoch: Somethings happening- the changes in board shapes and what is happening in New Zealand, particularly Wayne Parks. 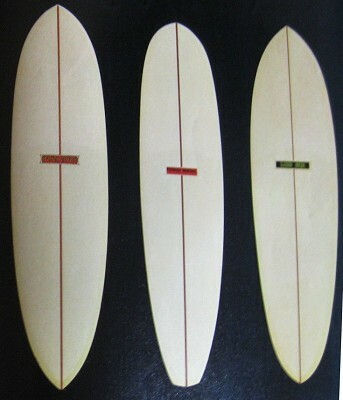 Cabell shaped the White Ghost surfboard in early 1969. An 8’3 foot long, 4” thick, with down rails, the White Ghost was a speed spear. Designed for maximum speed, the surfboard would help Joey win the 1969 Duke Kahanamoku Invitational Surf Classic at Sunset Beach, despite competing with a broken rib during the Finals. “The white surfboard that I won the 1969 Duke with, there was no other surfboard that fast in the world. Period. Not even close. I shaped the board as I was passing through Huntington Beach at Plastic Fantastic. The board was 18 and a half inches wide. I didn’t name the surfboard. Everyone around me in Hanalei just started calling it the White Ghost. 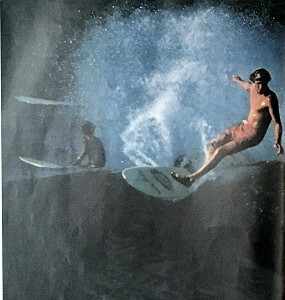 California surfer Rusty Miller, himself a Duke finalist in the 1967 and 1968 contests, snapped this now iconic photograph of Joey and the White Ghost at the 1969 contest. 1969 White Kite by Ted Spencer (Shane). 6 ft x 19" with 8" diamondtail.50/50 rails at nose,soft in centre and hard at the tail.S deck.glueline stringer. 7 ft X 19" refinement by Midget Farrelly. Foiled template hard rails in tail and glueline/stringer. Impeccable finish. 1969 Side Slipper -DownRailer : developed by Midget Farrelly, featured soft down rails from nose to tail, flat bottom,super kicked roundednose and finbox with small fin. 7 ft 6" X 20 1/2"with a 4" pod. F. Sea of Joy - hyper knicked nose model ridden, but not using sideslipping technique, by Reno Abellira at Johanna and Angourie. F. Pacific Vibrations - various riders use side slipping technique throughout the film, the most outstanding being Merv Larsen, riding a finless surfski with seatbelt. 1969 Hull 6 ft x 20" wide tailed single fin with faired chine rail panels from nose to mid point, derived from Greenough’s Spoon design. Boards by Chris Brock/Garry Keyes at Wilderness Surfboards, Ted Spencer at Shane Surfboards and Robert Coneely at Hayden Surfboards. ,Herbie Jefferson- The Jefferson Flyer, speed track dirt motorbike rider and surfer. Keyo Surfboards, with adjustable fin box. Angourie: A place to see...and be - Greenough ,McTavish, Platt, Keyes, Brock and Purchase. Kevin Platt: The Sea , Waves and The Places. Kevin Platt: The Equipment and Everyoneofus. John Hogan: Waves can do that thing to me. wins the “” (with fine double spreads) highlighting the radical surfing of and others. Paul Carey: Has Surfing Reached an Age of Responsibility? Brad Mayes: The Schoolboys, contest at Manly Beach. Kevin Platt: The Basics of Form and Design..
Advertisements: Farrelley Surfboards, Peter Drouyn Surfboards, Rip Curl Surfboards, Surf Design Surfboards. First designed (probably) by Peter Crawford at Wallace Surfboards as a high flotation alternative to Greenough’s Spoon. Approximately 5 ft x 22" with Waveset finbox, this design has current application and has had a full range of fin setups. 4 October 1969, page 24. SURF boards, 1 Woods Pin [tail] 8ft 2in, exc cond $70, 1 Clark stubby [v-bottom], suit beginnner, good cond $50. SURFBOARDS, second hand trackers, 2 Gordon Woods, 1 Gordon and Smith good cond. 1 summer surf shape and 2 pintails all priced be tween $60 to $70, also 2 stubbies 1 for $30 and $40. Prices Newsagency, Civic opp Mall 42914. SURFBOARDS, new by Farrelly, Dale and Woods, custom orders 2 to 3 weeks del. 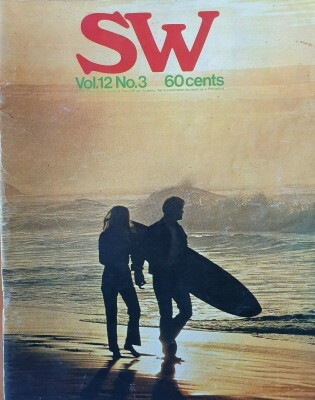 Surfing World 1969 Volume 13 Number 1. Cover: Col Smith (NN), Keyo surfboard, Angourie. Richard Kavanaugh: Newcastle, featuring Terry Fitzgerald, Neil Purchase, David Treloar, Wayne Williams, Kevin Parkinson, and Ted Spencer 1st, who recently designed and shaped his latest creation the White Kite. Bud Browne: Yesterday- history of Big Wave surfing with Ricky Grigg, Buzzy Trent, George Downing, Pat Curren and Mike Doyle . This article is an extracted from Peter Dixon's Men Who Ride Mountains (1969). Joey Cabell, with a very narrow single fin big wave gun surfboard. Dale Surfboards, Bob McTavish shapes. Jock Sutherland at Pipeline, winter 1969. Geoff Cater (1999 - 2017) : History : Innermost Limits of Pure Fun, 1969.